Teaching Children with Special Needs: Paint Outside - Jackson Pollock Style! Paint Outside - Jackson Pollock Style! Jackson Pollock inspires visual and gross motor self expression! Can't find a place to paint inside? Afraid of staining your carpets and floors? Go outside, and leave your worries behind.! Most parents are afraid to bring paint, clay, and fluid art materials into their homes for fear of creating a mess. But paints and other fluid art materials provide tremendous growth and learning opportunities, beside being lots of fun. Let's face it, there's nothing more enchanting to a child than fresh paint, and lots of it. Paints are wet and colorful, they move, mix and blend together quickly, and they plunge you into a sensory experience. No wonder they're so much fun! Check out this handy art area I created for my own children along the side of my home. They spent hours here, and while it must have felt like a "real art studio," it was really just the fenced in driveway outside our kitchen. 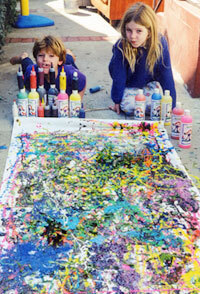 Often I would spread out rolls of fabric or paper and give them BioColor® to squirt on "Jackson Pollock" style. The colors were always brilliant. Sometimes we would drag small tree branches through the BioColor® or sprinkle on glitter and various odds and ends before the paint dried. There was nothing they liked more, and I could see the freedom and joy they felt with this "free-style" painting. By putting the BioColor® in squeeze bottles, I was able to provide some small control over the quantities of paint they used, which gave me a wee bit of comfort. Living in the city of Los Angeles, we have a small yard and not much space. But take my word for it...if anyone can create a home art area while living in LA, you can do it anywhere! Be inspired.